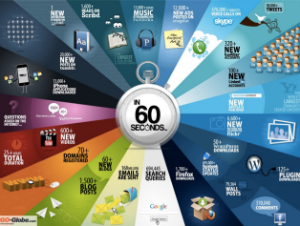 What happens on the internet in 60 seconds? 1,500 Blog Posts, 60 New Blogs, 98,000 Tweets, 20,000 Posts on Tumblr, 600+ New Videos Uploaded to YouTube, 6,600 Images Uploaded to Flickr, 79,000+ Facebook Wall Posts and over 695,000 Facebook Status Updates. What does all that activity have in common? It’s content, it’s social and presents a ripe opportunity for optimization. Content Marketing is a hot topic and deservedly so. According to an AOL Nielsen study in May 2011, 53% of all time on the internet is content consumption. In the U.S. alone, 27 million pieces of content are shared per day. In the Junta42 and MarketingProfs B2B Content Marketing study, it was reported that 90% of marketers use content marketing and 51% plan to budget more than the previous year. To help businesses, strategists and practitioners make sense of the opportunity, the first Content Marketing World conference in Cleveland, OH this week will bring together an impressive mix content marketing smarties, strategists and practitioners. My little slice of this content marketing pie concerns the intersection of Social Media and SEO as assets for an effective Content Marketing Strategy. The Importance of a Holistic Approach – Organizations are achieving certain levels of effectiveness by employing Search, Social Media and Content Marketing strategies independently vs. not at all. However, the opportunity to really master the ability to optimize for consumer/buyer content preferences for discovery, consumption and sharing is too significant to ignore. A holistic approach to Content Marketing leverages optimization of content for user experience that includes search visibility and social sharing as well as engagement that inspires business outcomes for marketing, public relations, customer service, human resources and other functional areas. 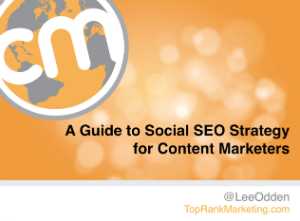 How Exactly Do Social Media, SEO & Content Marketing Work Together? – The possibilities are exciting when you think about how both search and social media optimization can elevate relevant content visibility, especially to target audiences that are actively looking. The path from research to purchase involves interaction with search and social influences at an increasing rate. A study by GroupM and comScore reports that 48% of buyers were led by a combination of search and social media to purchase. The effect of interacting with search and social influences can vary by topic, phase in buying cycle, geography and person. Companies that incorporate Social Media and SEO in their Content Marketing Strategy can amplify their ability to be the most visible and relevant resource throughout the customer lifecycle. Additionally, social content and links can be influences (directly but more likely indirectly or conditionally) on standard search visibility. Tactical Best Practices and Examples – Rounding things up includes a few examples B2B and B2C that illustrate at a high level, the implementation of these 7 steps and the resulting outcomes. Readers of Online Marketing Blog know how enthusiastic and persistent I’ve been at promoting Social Media SEO and Content Marketing. The number of companies operating these functions independently is simply astounding. The opportunity to amplify or “Optimize” online marketing effectiveness towards reach and engagement is too significant to keep Social, SEO & Content in silos. I greatly appreciate opportunities to share this perspective at events like CMW. If you’re attending Content Marketing World, I do hope to see you Thursday, September 8th at 2:00 PM for my presentation, “A Content Marketer’s Guide to Social Media & Search Strategy”. For a deep dive into the subject, you might also want to check out,”Optimize: How to Attract and Engage More Customers by Integrating SEO, Social Media, and Content Marketing” to be published by Wiley early in 2012. I would love to see a large version of that infographic at the top! Lee. You make some excellent points regarding content marketing, and my experience in Canada matches your US data regarding online content marketing. This has much to do with the fact that online ads (I’m speaking about banner ads) lack the same credibility that they used to. And the era of social media has placed more emphasis on the need of organizations to build brand equity via informal communities of support. I am sorry that I will be unable to attend your conference. Oh hey that falls on my birthday!lols. I wouldn’t be able to go, but I do hope you can put up a slideshow of some sorts after. I’d really love to see it. I would like to see also that 60sec. slide as a larger graphic. Please share with us. thanks for the info you have explained and very helpful .. I am very interested to try it. successful and familiar greetings greetings from me .. thanks .. This looks fantastic. The intersection of SEO, PR and social media is where the most effective marketers are going. This stuff is endlessly interesting. Can’t wait for the book! Can you share bits of it in the blog? Nice Article. Definitely Social media marketing is here to stay. And marketers everywhere are scrambling to figure out how to best capitalize on the opportunity…before their competitors beat them to it. I wouldn’t be able to go, but I do hope you can put up a slide show of some sorts after. I’d really love to see it. I’m a big fan and agree wholeheartedly with the intersection of Search, Social & Content Marketing. In fact, it’s the main focus of my work here in London, UK. Distance means I won’t be able to see your talk in Cleveland. Any chance there is a way to connect (possibly via Twitter – http://twitter.com/eldadyogev) so I can see the slides? Yup, Lee…the presi would be a great addition here for those of us who ain’t gonna make it there…. A lot can happen in 60 seconds, hey? What a haapens when social media and SEO meet? Trust! We created http://publishedin.com to help content marketers distribute their content, boost traffic, sales and improve SEO rankings all without advertising. I’d much appreciate to hear your perspective. I believe that the seven-step SEO Strategy you implemented in this blog is really helpful. SEO and Content Marketing must have these steps for them to be more functional and effective. It seems obvious that everyone would create content to share it, doesn’t it – yet it’s still surprising how many old school websites are not taking advantage of combining Search, SEO and Social when creating their content. Content without sharing via Facebook, Twitter, Tumblr or Google+ are huge missed opportunities. As you mentioned, (silos), anyone who isnt combining all of these efforts together is missing big audience opps. Those were golden 7 steps for any content marketing. As all we know content is the king and the more you are able to make yourself visible to the audience the more you profit. Sad to missed you seminar as I have logged today only, but hope to attend next time. Social network isnt bad, but it’s not targeted traffic. You just post things to random people who probably aren’t buyers and aren’t interested in what your selling. So you must also make your posts interesting and catchy, if possible add a visual or your product or something. I think the guideline for all internet marketing Mark is “be interesting and intentional or don’t bother”. That applies to social media marketing as well. Thanks for such insightful infomation.